It’s getting cold outside. Be sure to bundle up your baby safely while riding in his or her car seat this winter and while visiting friends and family. Sudden Infant Death Syndrome (SIDS) or other causes of infant death can happen at home, on the road, or while visiting family. In 2016, there were 28 infant deaths from SIDS and accidents in Wisconsin. Buckle your baby in and tighten car seat straps. You should only be able to fit one finger under the strap at the collar bone. Slide the chest clip up so it is at the top of the armpits. Once your baby is strapped in, put your baby’s coat on backwards or put a blanket over them. This is a safer way to keep them warm, along with putting on a hat and mittens. Make sure that the coat or blanket can’t cover their mouth. Take off extra layers and their hats as the vehicle warms up. Your baby can overheat as the vehicle gets warmer. Babies should only wear one more extra layer than an adult. Give your baby breaks from the car seat at least every two hours. Stop the vehicle and take your baby out of the car seat frequently. This will prevent strain on baby’s growing spine and keep baby’s positioning safe and comfortable. Take baby out of the car seat after you arrive. 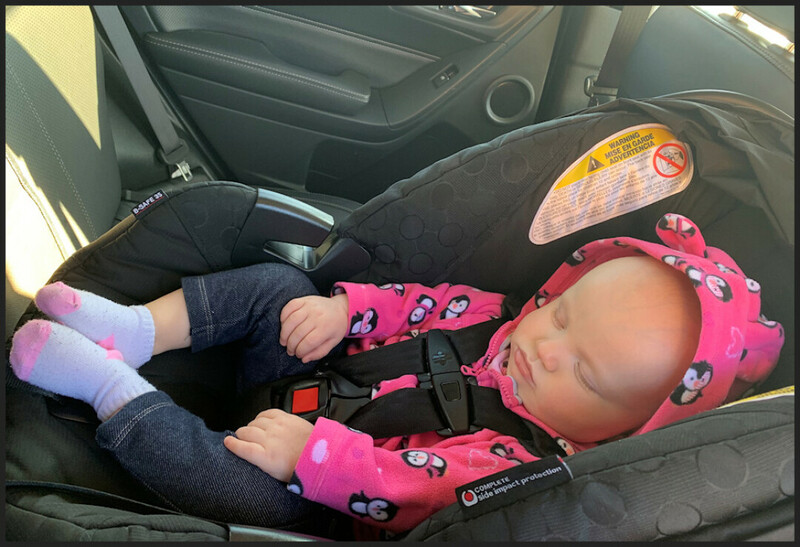 Car seats are not an approved safe sleep option for babies when they are out of the vehicle. Make sure you have a safe sleep place for baby. A portable play yard like a Pack ’n Play™, crib, or bassinet are good choices. Don’t put them on a soft surface such as a bed or couch. Make sure anyone who is watching your baby knows how to put baby to sleep safe. Remember the Safe Sleep ABCs: Alone, on their Back, in a Crib, and in Smoke-free air. Call the Eau Claire City-County Health Department at (715) 839-4718. Ellen Jacobs, MSN, RN, CLC, is a public health nurse with the Eau Claire City-County Health Department.